Let’s face it. 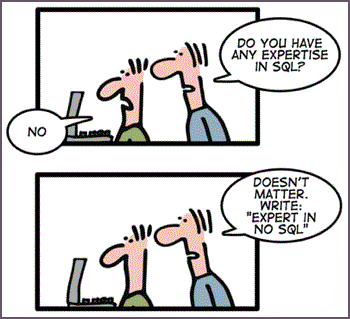 Many companies struggle to find good NoSQL developers. And, if they are successful in finding developers, how they will hire the right person to serve as NoSQL developer? The person who excels in interviews and jumps out on paper may not necessarily live up to your expectations. That’s why I decided to write a post on NoSQL to provide you with the necessary methods to evaluate the skills of the candidates and a set of application-oriented interview questions to hire great NoSQL developers. I hope the below is not the scenario with you. To make sure you have to look beyond the candidates' two page resume and bring in the best for the interviews. The demand for database management skills has expanded beyond Web or software companies. Companies are seeking individuals with skills in managing and analyzing large data sets. And when it comes to the most desired skills, it should come as no surprise that NoSQL knowledge is highly desired. As companies are becoming more information-driven than ever before, they desperately start seeking NoSQL professionals that can help in their database efforts. Choosing the right NoSQL developer is essential to your organization. The right talent can be pivotal to your software development team. While most developers typically have some understanding of how NoSQL works, true expert NoSQL developers have an established competency that is significantly deeper than average NoSQL developer. So to assess NoSQL developer this post guides you to how you can evaluate the candidates for their skills, the interview questions and hire great NoSQL developers. 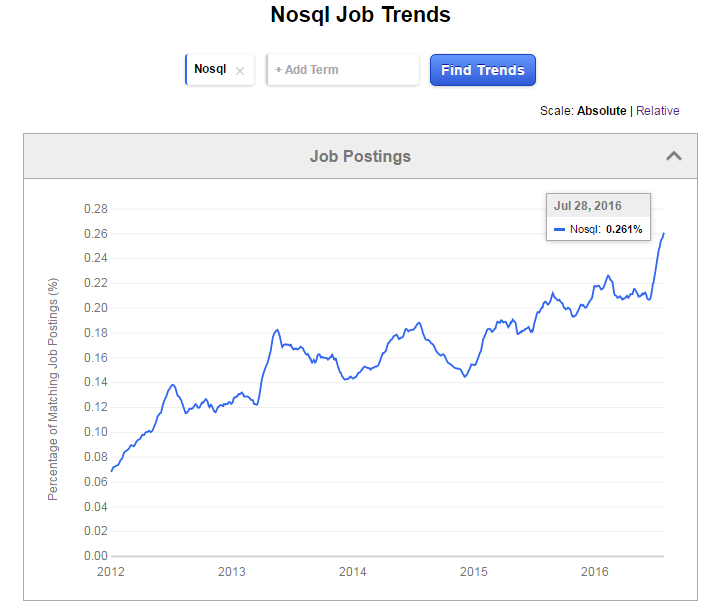 Before interviewing candidates, make sure you evaluate the candidates with NoSQL assessment. 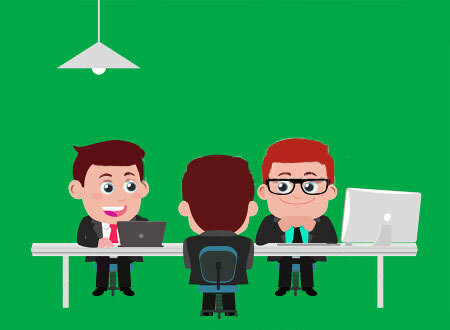 Testing your candidates with online pre-employment skills assessment test will help you to determine the top one percent of NoSQL developers among the ones you were successful in attracting. As an employer, you can easily evaluate candidate’s knowledge on various concepts and technologies with NoSQL test assessment. 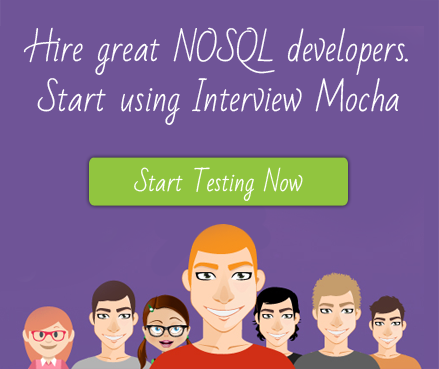 Interview Mocha’s Online NoSQL Test consists of questions and tasks whose difficulty matches the responsibilities the candidates for the job role you are hiring. These assessments give balanced emphasis to both theory and practical questions. Now here is the comprehensive list of application-oriented NoSQL developer interview questions for experienced to assess the working knowledge of developers. 1. What is the difference between NoSQL and RDBMS? Why and why not to use NoSQL databases? What are the various advantages of NoSQL databases? 2. When should I use a NoSQL database instead of a relational database? 3. Could you explain the transaction support by using BASE in NoSQL systems? 4. Have you heard about “polygot persistence”? If yes, then explain. 5. Does NoSQL Database Interact With Oracle Database? 6. Tell me the challenges of using NoSQL. 7. Can you explain what Big SQL is? How Big SQL Works? 9. At what level is there a problem with this data? 11. Does NoSQL Database Interact With Oracle Database? 12. Is There Any NoSQL Database As Simple As SQLite? 13. What do you know about Impala? Explain some benefits and drawbacks of Impala. 14. What Scalability Problems Have You Encountered Using A NoSQL Data Store? 15. What was the most interesting project you have participated in? Can you describe it and tell why you consider it to be so interesting? 16. Do you remember any programming project decision you made that was a failure? Why do you think it was a mistake? Why did it happen? What did you learn from this experience? Process thinking questions: Analyze the thought process of the candidate by asking him a technical issue, design question, or problem-solving puzzle. Problem-solving questions: Repurpose a problem from a current project you have, and see how your potential hire goes about solving it. When interviewing candidates, ask broad questions (without looking for correct answers) to gauge both existing knowledge and the way a candidate thinks through a problem. There is more to interviewing than tricky technical questions, so these are intended merely as a guide. You are a hiring manager or recruiter and want to have a better talent pool to select from. A well-planned hiring process is what allows you to find a great NoSQL developer. If you have any question on NoSQL or piece of advice to share, please let us know in the comments below!